As most of you are aware, retrofitting a/c systems from R-12 to R-134a is essential in our market; R-12 has simply become too expensive. Most R-134a retrofits are simple and effective if you follow proper guidelines. Of course, there are a few exceptions. One of those exceptions happens when trying to convert a 1989-93 Dodge Caravan. This vehicle uses the Denso 6C17, 6 cylinder, Wobble Plate, Variable Displacement Compressor. My first few attempts at retrofitting these models produced disgruntled (sweaty) customers. In an attempt to save the van owners the added expense of a larger condenser and electric fan, I decided to “experiment” by adjusting the control valves. Perseverance has brought success; we can now deliver reasonably cold air in those vans, without the additional components! Right: Dodge minivan 6C17 compressor with bracket side showing. 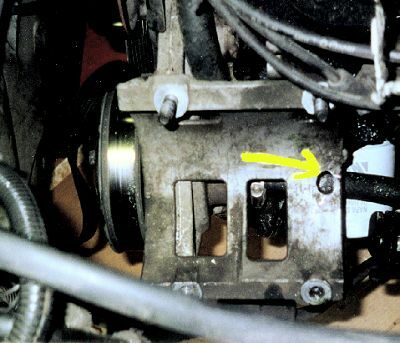 The arrow points to the whole drilled in the bracket that allows adjustment of the main control valve. While the van is running, turn the valve one complete revolution clockwise. Note that these vehicles were out of warranty and no permission was sought from the manufacturer to perform this modification. Please do so at your own risk. First, I do not recommend retrofitting a Caravan with the 6C17 compressor if the system has an auxiliary (rear) unit. The condenser is just too small to dissipate the heat from both front and rear evaporators. The only acceptable retrofit solution for these vehicles is to replace the OE condenser with a larger, more efficient unit. Fortunately, there is plenty of grill space available. I have found that both a universal 6 mm and parallel flow condenser, large enough to fill the available space, will work fine. Certainly you will have to make some modifications, such as changing the mounting brackets and replacing the discharge hose and liquid line. While the task seems tedious, the cold air will appear. Your other option, of course, is to leave the system in R-12. On the other hand, vehicles with a single, front evaporator are qualified for a less costly approach to good cooling. I’ve found that on these systems the low side pressures are higher than normal. This is because the control valves in the variable displacement compressor are not calibrated to handle the pressures and temperatures of R-134a. From my experimentation, I’ve learned that just by turning the main control valve on the compressor approximately one complete turn clockwise, the low side pressures will drop and the system achieves a vent temperature of about 10° colder. Below: A/C system pressures and temperatures achieved merely by adjusting the mail control valve of the Denso 6C17 compressor. Parameter Before Adjust. After Adjust. It is important that you adjust the correct valve. There are two valves on the compressor: the main control valve (larger) and the sub-cooling control valve (smaller). The main valve is usually difficult to reach and is blocked by the compressor bracket. So, I drill a hole in the bracket just large enough to pass through a normal screwdriver. Editor: If you have questions about this procedure, contact the editor, or Tomas Chavez at 619-234-7991. The Automotive Air Group is a unique 16 year old non-profit group of automotive air conditioning repair shop owners, A/C suppliers and remanufacturers. Our objectives are to share A/C technical expertise, maximize buying power, develop a nationwide warranty network, and share shop operational information. Contact their President, Spencer Riddell, Air Mobile of Brevard Inc., Melbourne, FL for more information. His phone is: 321-259-6522.